What began as a quirky loosely-based parody of Doc Brown and Marty McFly in Back to the Future has evolved into an intergalactic/interdimensional animated sitcom about a dysfunctional, but well-intentioned family of misfits. The complexity and brilliance of Rick and Morty isn’t surprising if you’ve been tracking the careers of its two creators. Dan Harmon has made a name for himself as the architect of the beloved, deconstructed sitcom Community and Justin Roiland is known by Channel 101 fans for his scifi cloning comedy House of Cosbys (as well as the voice of the Earl of Lemongrab on Adventure Time). 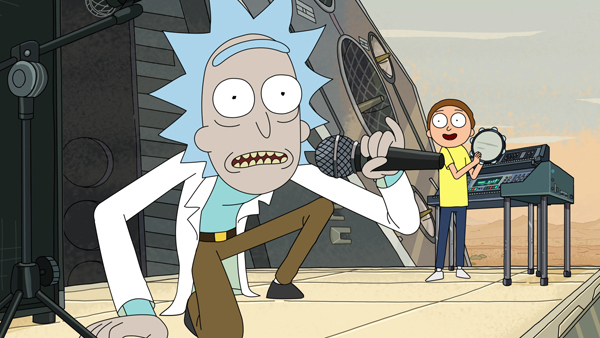 We talked to Roiland last year about season one of their brilliant Adult Swim show, so with season two rapidly approaching, we caught back up with him and Harmon to talk new character combinations, the trouble with clearing DMX songs and the unique experience of attending Comic-Con.